Based on Christopher Nolan's The Dark Knight Rises film! The Batman Sci-Fi Revoltech #047 recreates the camouflaged Tumbler used by Bane's army to terrorize Gotham City in the final chapter of the epic Dark Knight movie trilogy. Operating from within the sewers, Bane succeeds in tunneling through to Batman's arsenal of weapons and vehicles. 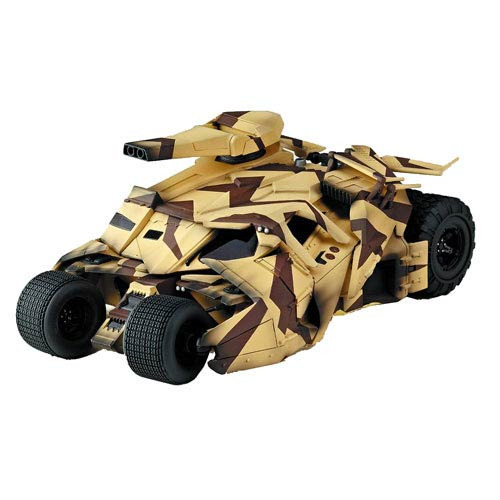 He commandeers several camouflage versions of the Tumbler, using the vehicles to strengthen his League of Shadow thugs. When Gotham's remaining police force finally mobilizes in the hopes of overwhelming the fewer-number thugs, Bane unleashes a handful of Tumblers which open fire on the police. This Tumbler measures 5 1/2-inches long and includes a Batman figure, flame exhaust, clear V stand, and nameplate.